Dong funerals are notoriously complex and consist of many phases. People who suffer accidental or unnatural deaths will be cremated whilst those who died from natural causes will be buried. The first phase is the “receiving of the breath” phase, where the family will listen out for the person’s last words and their last breath. Once the person has perished, three spoonfuls of clear tea and a small piece of silver are placed into their mouth. The corpse is then “washed” with wet paper money and the old clothes are removed and replaced with burial clothes. A “dream bed” is arranged for the corpse, similar to a wake, and the suona is played during the vigil. A red cockerel must be sacrificed before the corpse is moved from the “dream bed” into their coffin. 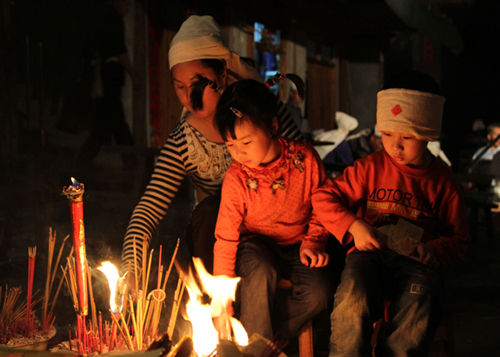 White cloths will be worn on the heads of the mourners, which is also common practice among the Han Chinese. The grave, which is referred to as the “well”, is then dug high up on a mountainside. A memorial ceremony will be held and gifts will be offered to the deceased as they are lowered into the grave. As prayers are being said, another chicken is sacrificed, lowered into the grave and then pulled back out for later consumption. A funeral reception is held at the deceased’s home. The sons will then build a burial mound near the family home and, once the burial mound is complete, the deceased is “called back home” to live at the altar of the family’s ancestors.